Review The Fedora Project has released the first beta of Fedora 12, the next major revision of the Fedora Linux line, and though it's still a work in progress, there are already some standout features, including a much improved power management system and support for the Moblin project, Intel's effort to make Linux work better on netbooks and mobile devices. Fedora has never been shy when it comes to adopting new features. Fedora 11, for example, was one of the first major distros to adopt the ext4 files system. 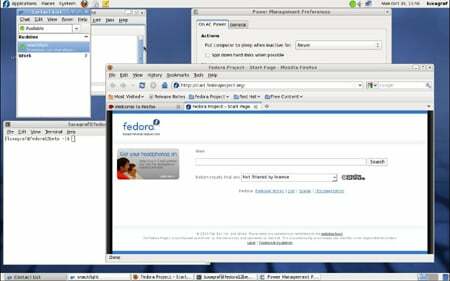 But with Fedora 12 the focus is much more on feature refinement and improving the stability and functionality of some features introduced in Fedora 11. Perhaps the most practical of the new features is the reportedly improved power management system. Taking some bits from Red Hat's Enterprise Linux 5, Fedora 12 will offer a new and easy way to switch between various predefined and extendible ktune-based power settings. The underlying power management tools, namely ktune, have been pulled from RHEL 5 and merged with Fedora 11's "tuned" system daemon and, according to the project's developers, will make Fedora 12 "use less power...while not affecting user experience." For the beta release, we stuck with a virtual machine install, so we can't verify Fedora 12's power saving potential, but once the final release rolls around, we're looking forward to putting Fedora 12's ktune to the test. Also new in the beta release of Fedora 12 is improved support for Moblin Core, to improve performance and deliver a better graphical interface for Linux on netbooks, mobile platforms and embedded devices. Moblin Core itself is built on the GNOME Mobile platform, which is the core desktop environment that sits of top of Fedora. The benefit for netbooks and other small screen devices is the improved user interface. Naturally, Fedora GUI environments aren't optimized for the small screens of netbooks and mobile devices, but the new Moblin spin addresses those issues and makes the Fedora on a netbook experience much nicer. Also part of Moblin is support for most of the common graphics and WiFi chipsets found in today's netbooks, though as always, Broadcom WiFi chipsets remain an issue.